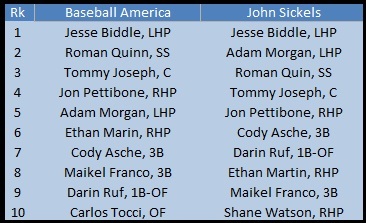 Two respectable top-prospect lists have been released recently, so here is a breakdown of how experts view the Phillies' farm system. It really should be no surprise that Jesse Biddle sits atop both lists. The 21-year-old has a lively fastball that tops out in the low-90s and possesses solid secondary pitches highlighted by a changeup with excellent fade. He currently projects as a high-end middle rotation starter and has put together outstanding strikeout rates in each of this three professional seasons. This year he is expected to open with Double-A Reading with an ETA of 2015. Roman Quinn is a speedy shortstop that has the tools to become something special. His plate patience needs to improve (2.18 K/BB ratio) and he struggles a bit in the field, but he has a knack for the gaps and can turn would be doubles easily into triples. Darin Ruf is on both lists, but that's mostly because of his power surge last season. Remember, he's 26-years-old and prior to 2012 had never hit more than 17 home runs in a season. He's expected to compete for an outfield spot in spring training. Tommy Joseph is the organization's top catching prospect and was the key piece in the deal last season that sent Hunter Pence to San Francisco. He brings raw power to the position but his numbers slipped a bit last season, putting up a .715 OPS with 11 homers and 48 RBIs compared to .787 OPS, 22 homers and 95 RBIs in 2011. Adam Morgan projects as a middle of the rotation starter. He has a slightly above average fastball coupled with a plus changeup, a pitch he drastically improved last season. He also throws a slider and a curve, but both need refinement to become legitimate strikeout pitches. Over 37 career minor league starts he's put together an outstanding 1.09 WHIP and a 4.0 K/BB ratio.